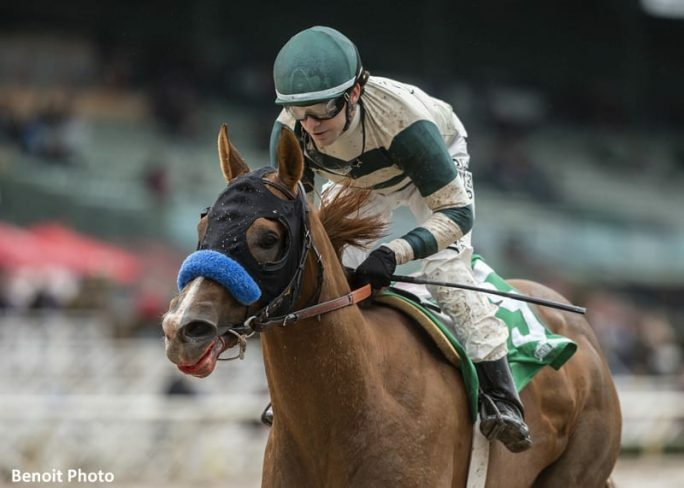 Sent off as the 1-2 favorite in the field of five sophomores, Michael Petersen's Mucho Gusto made short work of Saturday's G3 Robert B. Lewis Stakes at Santa Anita. The son of Mucho Macho Man, ridden by Joe Talamo for trainer Bob Baffert, splashed under the wire a 4 3/4-length winner to complete 1 1/16 miles over the sloppy course in 1:41.81. Mucho Gusto's win earned him 10 points on the Road to the Kentucky Derby, while runner-up Gunmetal Gray earned four points and third-place finisher Easy Shot earned two. After pressing the pace for the first half-mile, 29-1 chance Kid Cantina was pulled up sharply by jockey Geovanni Franco. The colt was loaded onto the horse ambulance, and drf.com later reported that he had to be euthanized as a result of his injuries. Longshots Kid Cantina and Magnificent McCool sped off to take the lead out of the starting gate, hanging Mucho Gusto a bit wide in the first turn. As Magnificent McCool wound up alone on the lead, setting fractions of :23.67 and :46.55 as Talamo sat chilly aboard the favorite in third position. Gunmetal Gray was last of the five-horse field down the backstretch. Mucho Gusto easily took command nearing the head of the lane and sped away to win by an easy 4 3/4 lengths. Gunmetal Gray came rolling late to gain second over Easy Shot. Bred in Kentucky by Teneri Farm Inc. and Bernardo Alvarez Calderon, Mucho Gusto is a sales veteran. He first brought $14,000 as a short yearling at the Keeneland January sale, then flipped for $95,000 at Keeneland September. He RNA'd at the OBS March juvenile sale, but wound up selling for $625,000 at the Fasig-Tipton Midlantic juvenile sale. Mucho Gusto won his first two starts, including the G3 Bob Hope, before finishing second to stablemate Improbable in the G1 Los Alamitos Futurity. Overall, the colt has won three of four starts for earnings of over $230,000. “He got to sit off the pace, which was good,” said Baffert. “They have to learn to do that, and I was really happy with Joe. He rode him with a lot of confidence today, like he was a good horse and he (Talamo) was on his own. I didn't give him any instructions…He's a good horse. He's a fighter, too. If they'd have hooked him, he likes to fight. 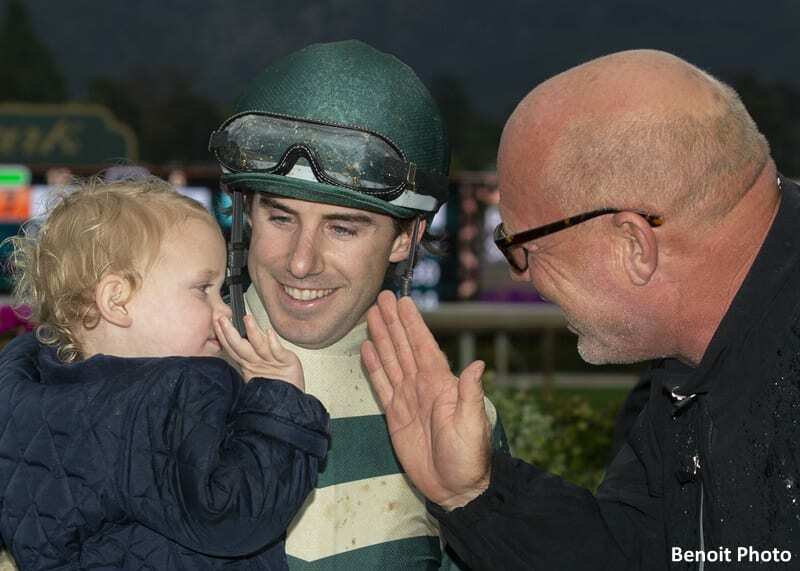 This entry was posted in NL List, Triple Crown, Videos and tagged gunmetal gray, kentucky derby, mucho gusto, road to the kentucky derby, robert lewis stakes, santa anita, santa anita park by Paulick Report Staff. Bookmark the permalink.